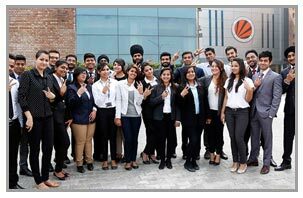 India's biggest technology based education-company ‘Think & Learn’ selected 38 MBA students of Lovely Professional University as Business Development Associates. Selected students will join their duties in this very month on 15th March 2016 at annual salary package of Rs Six Lakh. LPU students of MBA and B Tech-MBA integrated programs of the year 2016 passing out batch had attended on campus placement drive. Prior to their selection, LPU students faced meticulous conduction to analyze students’ deftness for PPT, Group Discussion etc. Located in Bangalore, Think & Learn is one of the leading providers of preparation courses for various competitive entrance tests like JEE, UPSC, CAT, GMAT and supplemental courses for School Education. It has over 35,000 enrollments in the current year. LPU students will imbibe company’s transparent business practices, convincing capabilities and various other marketing strategies in so early an age. The online paraphrase generator is best for students that can help them in various subjects. Now, the best brand is louboutin about shoes. Christian Louboutin shoes are inexpensive. I think the number of students will be more and more each year, as many training programs are presented and interest to them only increases. And MBA courses have long established themselves around the world and huge numbers of people want to learn the experience of successful business cases. Therefore, it's worthwhile to pay attention to various resources that help in learning and allow you to find homework answers and help to understand some issues. Time is of course crucial and one of the most vital points to be considered when it comes to submitting assignments in accordance with the deadline. Failing to come up with the assigned task according to the given deadline would simply worsen the scenario in the long run. Thus, students often end up looking for do my assignment Australia from experts who can ensure on-time assignment deliveries without fail. Thus, in order to meet such demands, the writing service industry cater to the needs of students by coming up with prompt and responsive writing support. Assignments and any other form of academic projects are absolutely important for students across the globe to consider for the sake of academic brilliance and a promising career ahead. If we are to talk about the scenario in Australia, then it is to be noted that students these days are often seen to opt for professional assignment writing help for their projects. Students Assignment Help caters accounting assignment help by its expert assignment writers. Our professional Expert writers serve students need and provide them the best academic guidance. Students can get help from our online assignment writers at any time.